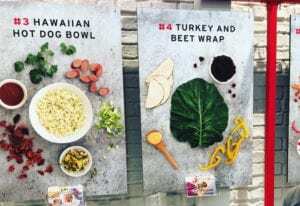 Small handouts served as attendees’ meal-selection ticket, and a takeaway recipe card. 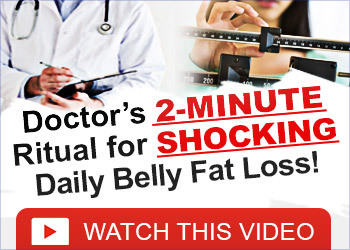 Dieting is never easy, but the Whole30 program, which eliminates the intake of sugar, alcohol, grains, legumes, soy and dairy, can be particularly painful for consumers due to a lack of readily available Whole30-compliant products. 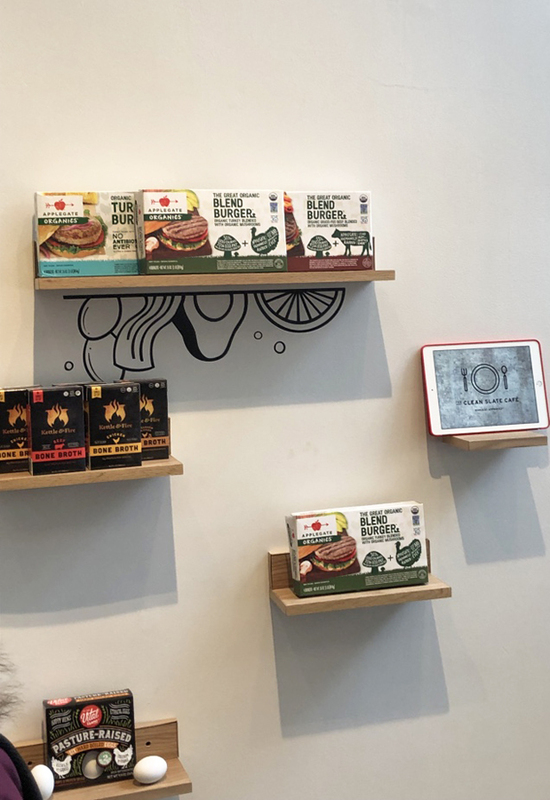 But with more consumers jumping on the bandwagon every day, Applegate is working to change all that by offering an array of Whole30-approved natural and organic meat products. 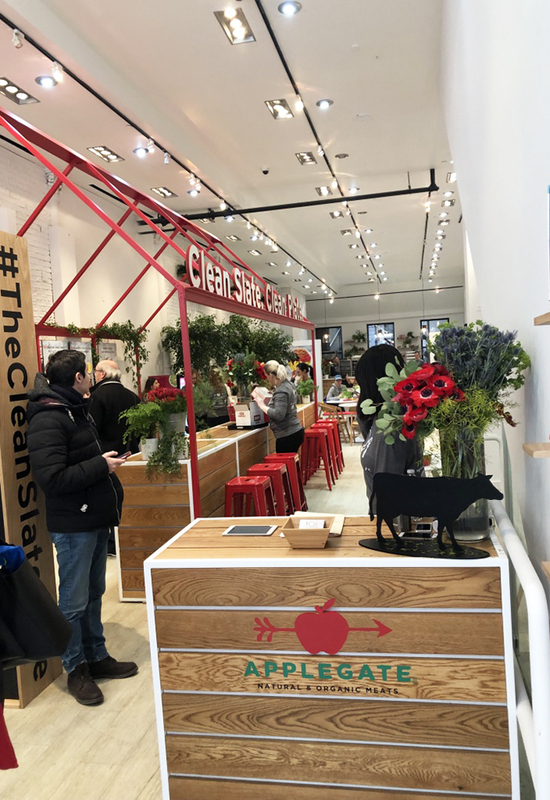 Of course, most meals consist of more than just meat, so to tout its newest line of products while helping dieters discover Whole30-compliant recipes and products from partner brands, Applegate popped up in New York City, Jan. 23-25, with The Clean Slate Café —and EM was on the scene (complimentary food has a way of attracting us). 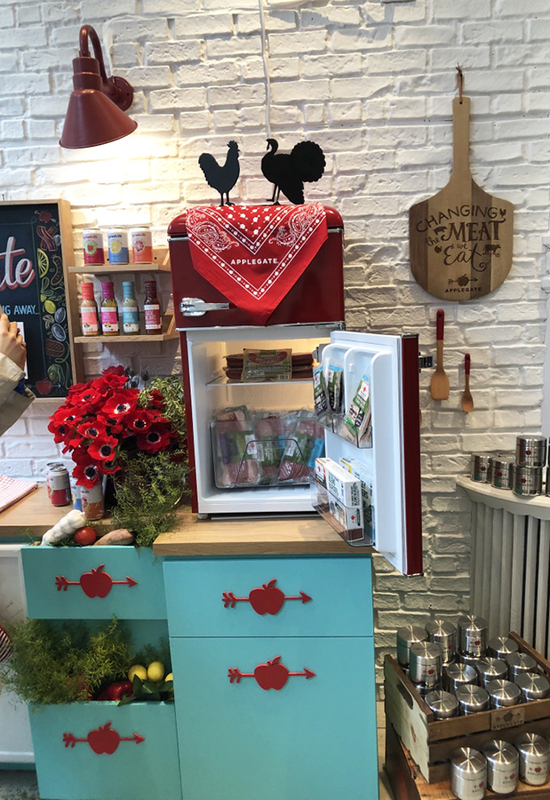 The free, Insta-worthy experience, which “sold out” online during the first few hours of registration, educated consumers on how to diversify their Whole30 meals while giving them a taste of Applegate’s branding, products and partners. Upon arriving at the SoHo pop-up, we were instantly struck by the clear attention to detail found within the venue’s experience design. 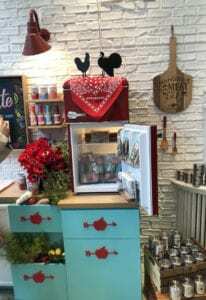 A vibrant aqua-and-red color scheme set the tone from the very start of the experience, with a beautiful replica kitchen offering a look at Applegate’s products in their natural setting, a “Clean Slate” chalkboard where consumers could fill in the sentence “I’m Wiping Away…,” lush produce and plants reminiscent of a farmer’s market, and a photo-ready environment. From the kitchen area, which served as a waiting room of sorts, attendees were guided in small groups through the rest of the pop-up. 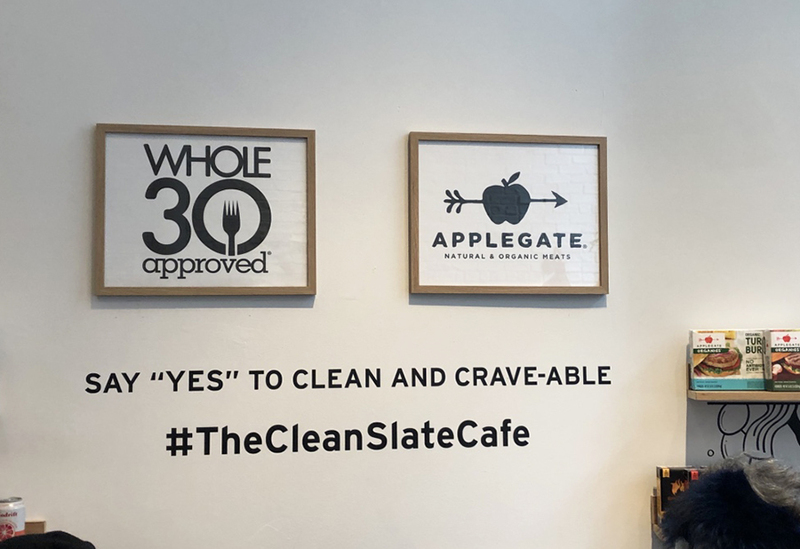 Our group, which included two women currently participating in the Whole30 diet, learned more about Whole30 and how Applegate and its partners, including Spindrift, Kettle and Fire, Primal Kitchen, CHOMPS and Vital Farms, are supporting consumers by creating products that comply with the program. As we listened, we munched on CHOMPS meat sticks and viewed five different posters representing the meals we would later choose from. The large-scale displays showcased the simple ingredients in each dish, while small cards below each of them served as attendees’ meal-selection ticket, and ultimately, a takeaway recipe card. Motivational messaging around health and Whole30 was spread across the venue. 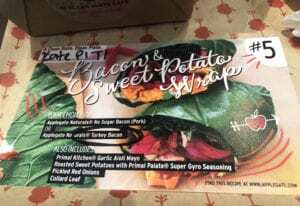 After a quick lesson on Applegate and Whole30, we chose our meal (a delightful turkey bacon and sweet potato “wrap”), found a seat inside the stylish café and chowed down. A cup of chili, made using a recipe that came from “The Whole30 Slow Cooker” cookbook, and a drink, were also part of the deal. 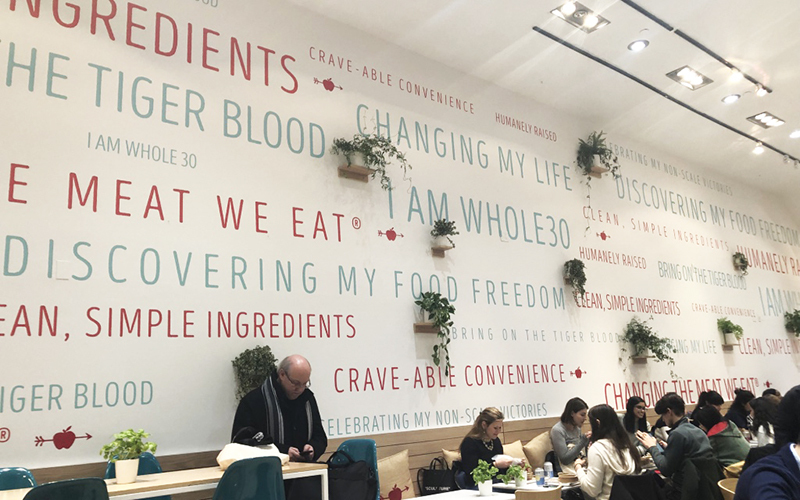 As we enjoyed our healthy bites, we couldn’t help but notice motivational messaging, like “Changing My Life” and “Discovering My Food Freedom,” plastering the walls of the venue—a reminder of why the brands created the pop-up in the first place. It was an altogether seamless (and scrumptious) experience with a clear strategy and message, and the kind of eye-popping design and dedicated photo ops today’s activations require in order to succeed. 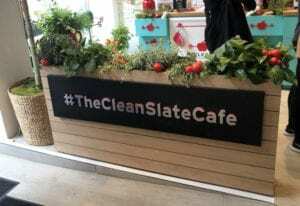 Suffice it to say that The Clean Slate Café was pretty much the whole package. For a more detailed overview of the experience, check out the photo gallery below. Agency: Cyrano Rox, Los Angeles. The post Applegate Touts its Whole30-Compliant Products at the Pop-up Clean Slate Café appeared first on Event Marketer.